According to the survey “Mediebarometern 2009” (pdf in Swedish) by Nordicom, the share of Swedes that uses social media on an average day is as large as the share that uses traditional media online. 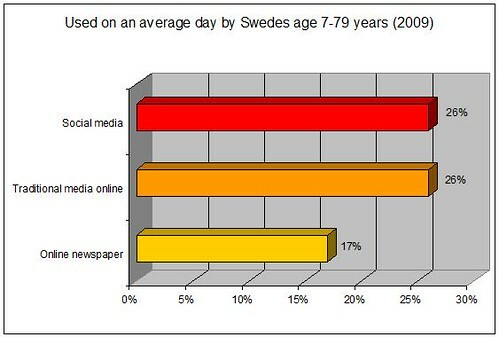 Among Swedes (age 7-79 years), 26% use social media and 26% use traditional media online on an average day. The survey also reveals that nearly 65% of 15-24 year-olds participate in “social networking” on an average day, while more than 50% of the young online users watch videos on YouTube. *Social media is defined as social networks, communities, forums, chat or blogs. Traditional media is defined as newspaper, radio or tv.